These newly-designed torque transducers are well-suited for a broad range of high-precision applications including both performance and endurance testing of engines, transmissions, drive systems, pumps, motors, servo motors, gearboxes, actuators, etc. The included interface software made PC setup and re-configuration easy and I didn't have to recalibrate! Announcing the ultra-precise MCRT® 48800V and 49800V Series Digital Torque Transducers from S. Himmelstein and Company. 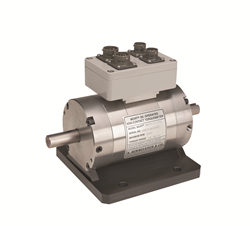 These are well-suited for a broad range of applications including both performance and endurance testing of engines, transmissions, drive systems, pumps, motors, servo motors, gearboxes, actuators, etc. Each offers extreme measurement accuracy with fast installed response, plus high mechanical overloads and electrical overrange. Output signals for torque, speed and horsepower are provided as analog (±5 or ±10 Vdc) and digital over RS232 serial port. Available capacities are from 2.8 to 42,000 Nm. They are available in two accuracy grades: ±0.04% and ±0.02% of full scale combined non-linearity and hysteresis, and have world class temperature performance. Mechanical overloads of 200% or 400% offers a safety margin in the presence of high startup torques or large torsional oscillations such as produced by Diesel engines. Electrical overrange of 150% avoids clipping of real world torque peaks and driveline torsionals reducing potential for errors in the average torque measurement. Output bandwidth is 1 kHz with 13 user selectable low pass filters. Included interface software allows fast PC setup and re-configuration while selecting from up to 33 units of measure, all without re-calibrating. All are calibrated CW and CCW to rated load in our ISO 17025, NVLAP accredited laboratory (NVLAP lab code 200487-0).